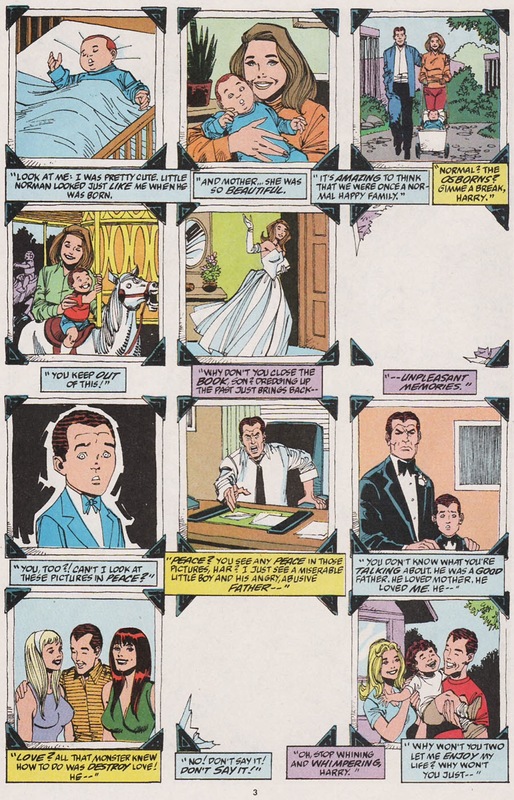 This long-running arc which spanned 10 issues of Spectacular Spider-Man and published over the course of nearly two years, demonstrates how two gross assumptions about the comic book industry and Spider-Man are patently false: 1) Spectacular Spider-Man was a secondary and inferior “B” title, and 2) nothing good ever came out of the gimmicky 90s. To the first point, the J.M. DeMatteis/Sal Buscema run on Spectacular in the early 90s marked one of a small handful of occasions where the “B” title was unquestionably the more compelling read than the main Spider-book. While Amazing Spider-Man was making headlines with the style over substance of David Michelinie and Todd McFarlane (and later Erik Larsen), JMD and Buscema crafted a masterpiece in character-driven storytelling that is considered one of the best Spider-Man arcs of all-time. 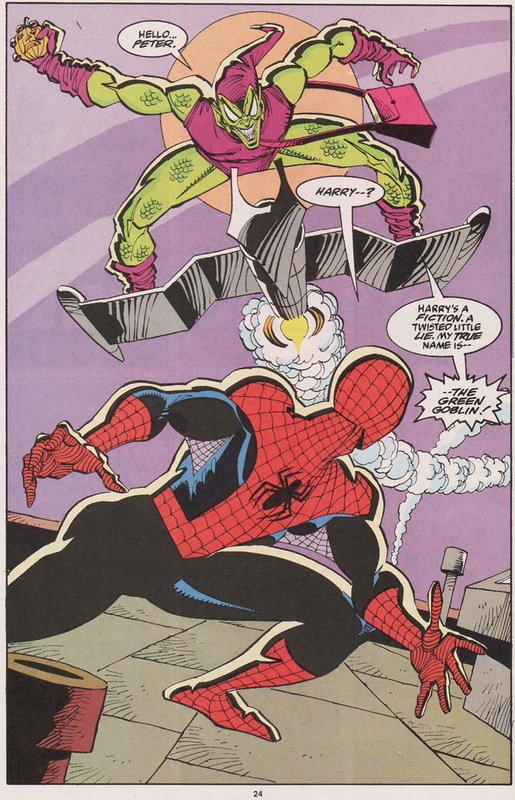 In this storyline, the pair examine Harry Osborn’s descent into madness, return to the Green Goblin persona and eventual death (which was later retconned during the “Brand New Day” era of Spider-Man). JMD is probably my favorite Spider-Man writer when it comes to characterization, as he has a knack for looking at established continuity and then finding dozens of new layers to peel back about Spider-Man, his family and his rogues gallery in a way that’s both revelatory and true to the character’s roots. We saw these skills on display in “Kraven’s Last Hunt,” which some have deemed the greatest Spider-Man story ever written, as JMD took a newly-married Spider-Man to some pretty dark places while also elevating Kraven to an upper echelon villain without inspiring a modicum of incredulity from readers. 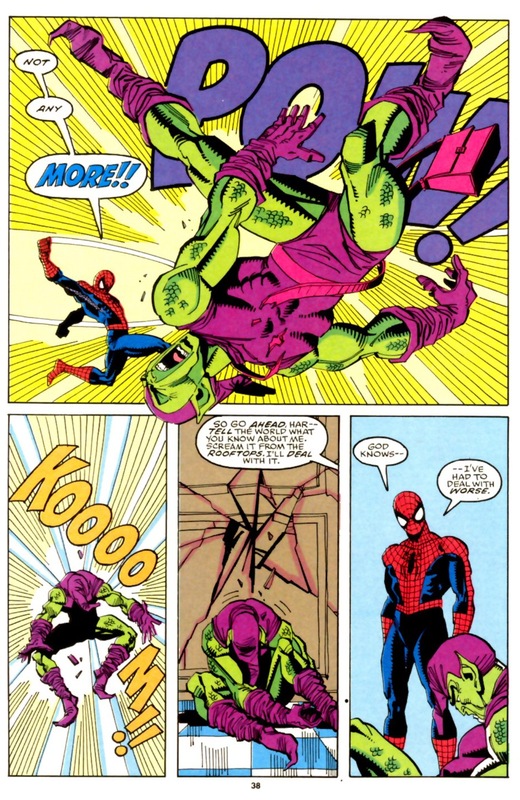 In terms of “The Harry Osborn Saga,” JMD builds on the classic Gerry Conway/Ross Andru storyline from the Bronze Age which first saw Harry succeed his insane father and become the Green Goblin, by breaking down the Peter/Harry dynamic brick by individual brick, directly leading to one of the Spider-verse’s most noble and tragic deaths. The initial portion of this arc, dubbed “The Child Within,” uses another favorite character of JMD’s, Vermin, as a jumping off point to examine the psychological impacts of Harry and Peter’s respective childhoods. 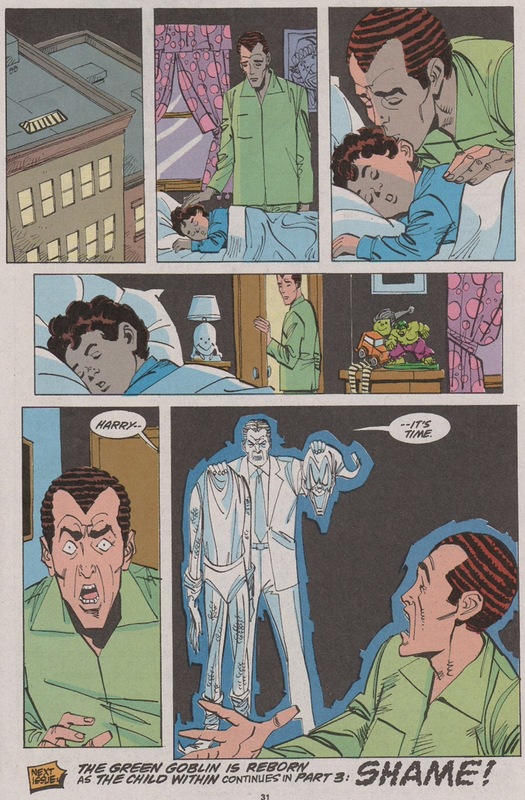 Before this storyline, it had already been established that Norman was a very cruel and abusive father to Harry, but JMD finds a way to go deeper in “The Child Within.” Norman’s ghost is seen haunting Harry at a time when he least expects it – as he’s blissfully watching cartoons with his son Normie. It’s utterly heart-breaking to watch Harry lose his entire sense of self and snap at Normie for being inattentive and “weak.” That’s because JMD makes us to believe that at his core, Harry is a good person, someone who doesn’t want to hurt his family. But Harry is also too badly damaged after years of Norman’s abuse. JMD selects what should be a quiet, ordinary moment, to mark a dramatic transition for Harry. JMD uses this moment to shine a light on an inconvenient truth about human nature: the vast majority of us are driven by vicious cycles of behavior and only the most exceptional of individuals are capable of overcoming these dark patterns. In fact, even the most exceptional are not immune, since Peter himself is driven down a dark path at multiple junctures during this storyline. What makes Harry’s descent all the more gut-wrenching is we are made to witness how this vicious cycle is inevitably passed down to Normie. At the start of this arc, Normie is a sweet little kid who watches cartoons and doesn’t understand why his father is yelling at him. By the end, Normie’s well has been poisoned by Harry’s toxic energy. We see Normie beating and smashing his Spider-Man doll in various scenes and while these panels might bring forth a chuckle from the reader, it’s an uncomfortable chuckle at best. Normie is a lost cause and unless something very dramatic happens in his life, he is destined to walk down the same path as his father and his grandfather (if he hasn’t already … I’m not the only one who speculated the Green Goblin in Superior Spider-Man could be Normie). In addition to continuing the Osborn family cycle, Harry forces Peter to deal with some of his own deeply-set childhood traumas. 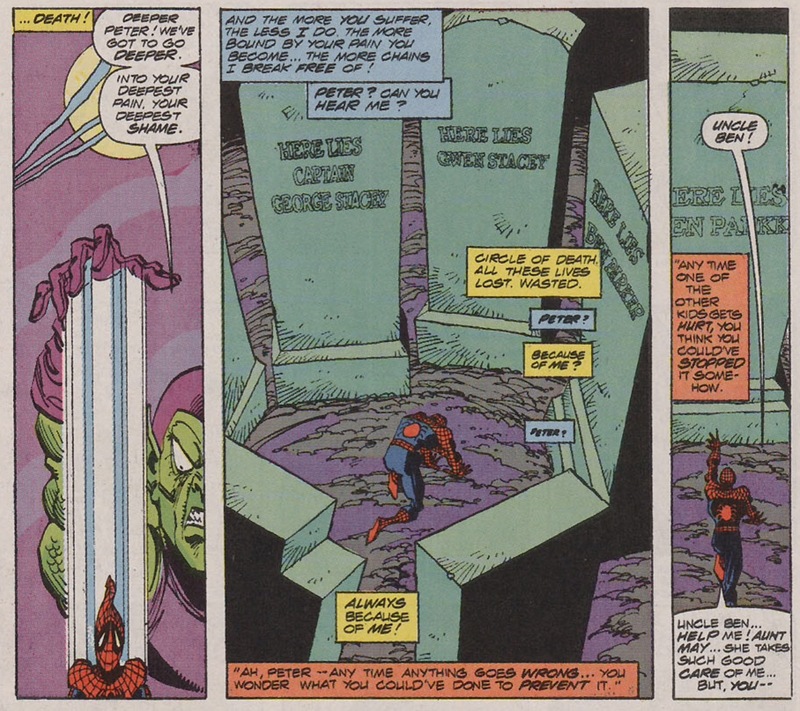 A hallucinogenic pumpkin bomb leads to a very despairing “dream” sequence for Peter where he’s in a graveyard facing the tombstones of all of the various people he had failed over the years (Uncle Ben, Gwen Stacy, Captain Stacy, etc.). That builds to JMD’s big reveal, which are the tombstones of his dead parents. That’s where we learn that Peter blames himself for their deaths. When I spoke to JMD last summer for the Superior Spider-Talk podcast, JMD mentioned how he believed Peter’s relationship, or lack thereof to his birth parents, was never properly explored by other Spider-Man creative teams prior to “The Child Within.” He said he wanted to take a look at the trauma one experiences after the loss of both parents – especially when that loss occurs at such an early age under very dramatic circumstances. We’ll often hear that children who come from divorced households will often cope with this major life change by blaming themselves for the situation. JMD uses this idea to advance Peter’s story and as a result, he illuminates the source of a key element of Peter’s personality: his overwhelming sense of guilt and responsibility. 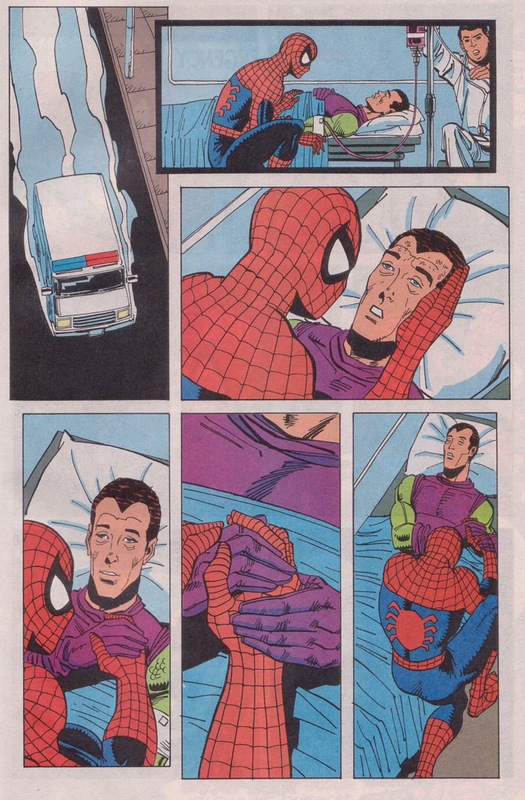 Of course, long-term readers of Spider-Man will note that Peter blames himself for the death of his Uncle Ben, which is why he went on to become Spidey in the first place. But JMD manages to add another layer to Peter’s back story – again in a way that never diminishes or tarnishes the character’s legacy. And just to tie it all together, during the dramatic finale of “The Child Within,” Peter has an opportunity to stop Harry but he doesn’t. He immediately blames himself for his failure, which begs the question, did something psychologically/emotionally prohibit Peter from acting out on his impulse to stop Harry? Say, a deeply-buried childhood trauma that has enabled the character to always find a way to blame himself for other people’s physical wrong-doings? If JMD and Buscema stopped right here at the last issue of “The Child Within,” they would have had a phenomenal storyline that would unquestionably earn a prominent space on my “top 10 Green Goblin storylines” list. And yet the creative team manages to take things a step further as they continue to escalate the tension between Peter and Harry, culminating with a grand finale in Spectacular #200 that echoes a Shakespearean tragedy. The story first takes a truly brutal turn in the special “30th anniversary of Spider-Man” edition of Spectacular #189 (complete with a hologram cover!). 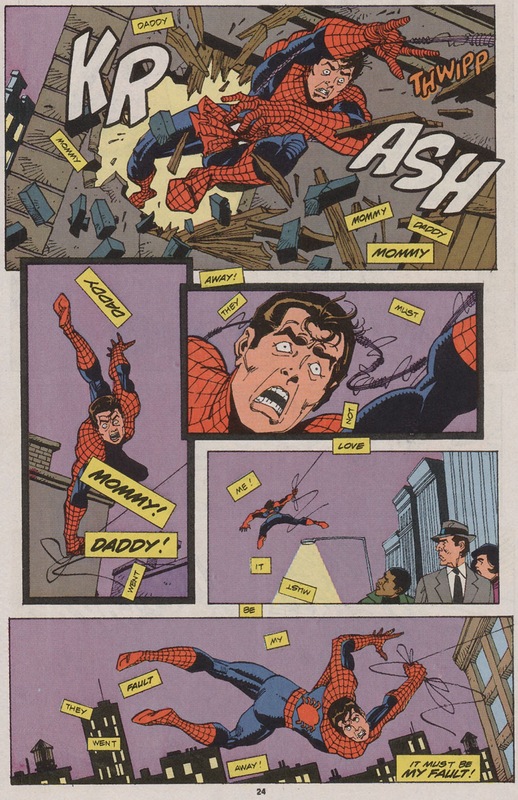 The issue marks Harry’s return after disappearing at the end of “The Child Within,” and he immediately kicks things off by declaring war on Spider-Man – sending him and Mary Jane bobby-trapped packages at his home and reminding Peter that he knows his identity and can strike at anytime. 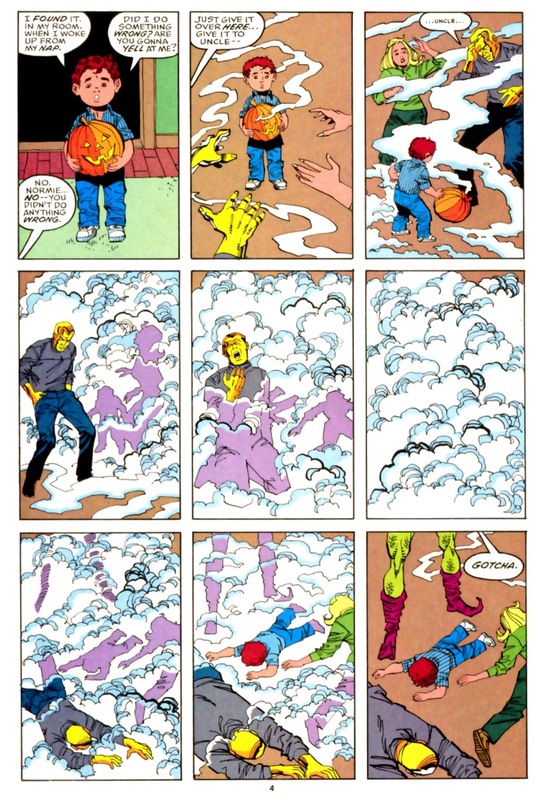 Meanwhile, Harry convinces his own family of his burgeoning madness after he uses a pumpkin gas bomb to knock out Normie, his wife Liz and his brother-in-law Mark Raxton (aka, the Molten Man). The dinner scene that follows with Harry, his family, and later Spider-Man, may be one of the best-written, painfully awkward sequences in Spider-man comics history. 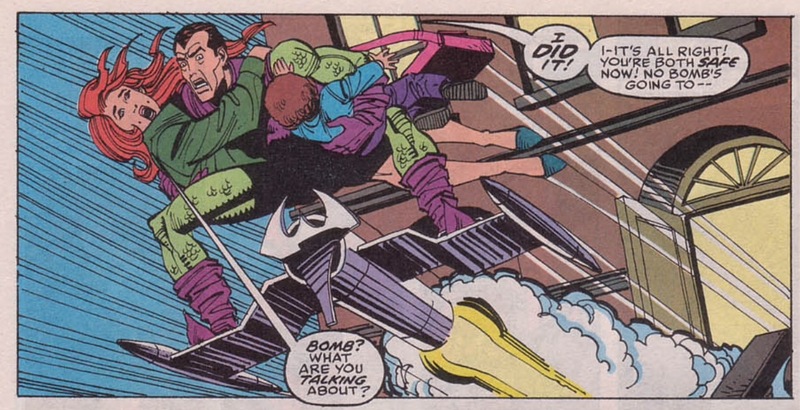 JMD’s script and Buscema’s artwork just nail every single character’s emotion in subtle yet powerful ways. As Harry rants and raves, we see the look of utter despair and resignation on Liz’s face, Mark’s frustration and Normie’s oblivious, childish glee. When Spider-Man joins the party, Harry taunts him by promising he will reveal his secret identity to the world – something that echoes Conway’s script in ASM #136-137. But unlike what happens in the Conway story, Spidey doesn’t feel any sympathy or pull his punches with Harry. Instead, he snaps and resigns himself that if Harry is going to destroy his life, there’s nothing he can do to stop him. The sentiment is later echoed in the Paul Jenkins/Humberto Ramos “Death in the Family” arc, when Peter tells Norman that he’s not going to live his life always waiting for the Green Goblin to act on one his maniacal impulses. The story bridges to Spectacular #200, which marks the last we see of Harry Osborn (alive) in the Spider-verse for a number of years. By this point in the storyline, things are at such a fever pitch between Peter and Harry, as a reader you just know before even getting to the end of the comic that the story is not going to end on a happy note. I wrote extensively about this comic for my Gimmick or Good? column at the Comics Should Be Good Blog. 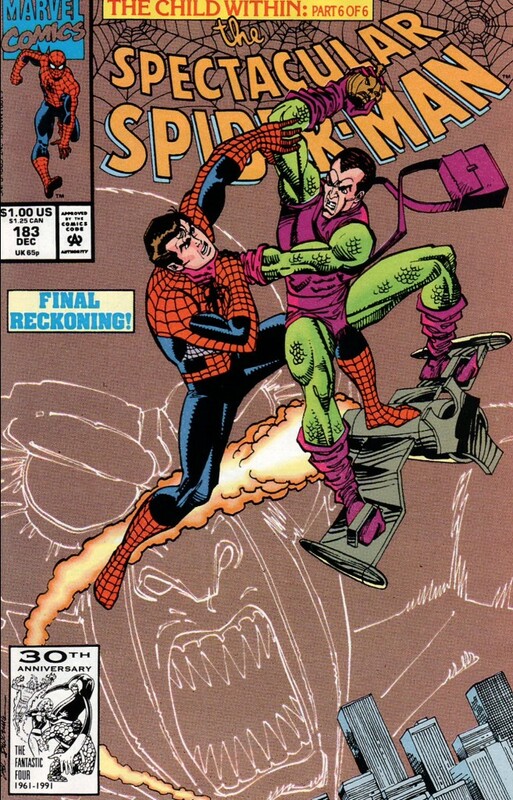 In my mind, Spectacular #200 might be the greatest Spider-Man comics of the 1990s. JMD and Buscema reconcile this long-running story in such a masterful, tear-inducing way that there aren’t enough superlatives in the world to describe it. Amazingly, JMD and Buscema revisit a lot of the emotional beats that they already covered during the first nine parts of this Harry/Peter stoyline, but in Spectacular #200 everything still manages to resonate at an even higher pitch. In this comic, Harry finally manages to succeed in defeating Spider-Man. After Harry continually torments Peter throughout the issue, baiting him into attacking before flying away and laughing maniacally, he traps Peter in a building that’s about to explode, before being overcome with one final moment of impulsive heroism and rescues him. The side effects of the explosion, and the adverse reaction Harry is having to the Goblin Serum he earlier ingested, leads to his death in a scene that conveys a waterfall of story and emotion without the use of a single word. The last few pages of Spectacular #200 are Buscema’s finest moment on the book, and are only rivaled in emotional heft by the JMD/Mark Bagley collaboration on ASM #400 a few years later. 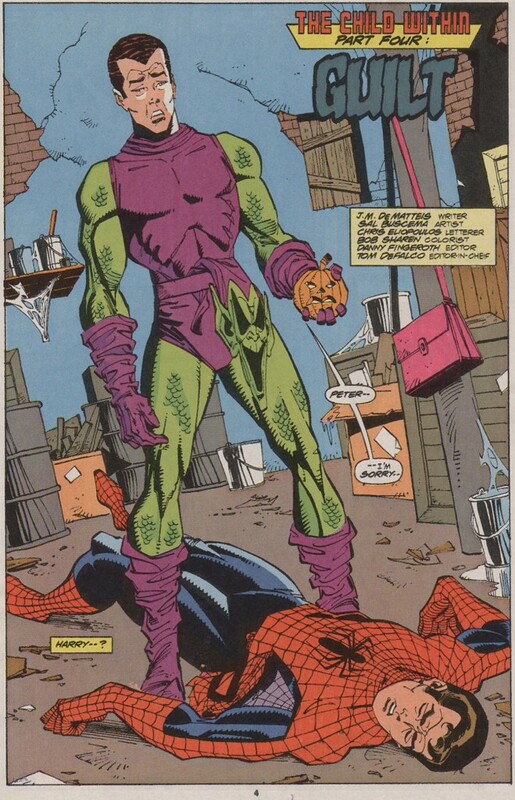 Check in next week for the final entry in my “Top 10 Green Goblin Storylines” list. I have never read “Child Within”, but I have read the other Harry vs. Peter issues. This article really highlights how they are all one big long story arc and how Spectacular #200 really was the emotional and thematic climax of Harry’s story. Oh man, you need to check those earlier issues out if you can… they should be relatively easy to find. I was hoping that it would be on Marvel Unlimited!